Keep your head and hands covered. Less heat escapes from your body and you stay warmer when you wear a hat. Gloves are helpful, but can be cumbersome when training your pooch on walks. If you’re walking a relaxed dog, winter gloves with some traction to hold onto the leash are OK. If you’re training or walking a difficult to control dog, consider horseriding gloves. These are thin and allow free motion to deliver treats, pick up after your pooch and hold the leash. Opt for gloves with traction for a better grip of the leash. Waterproof shoes are essential. If your feet get wet and cold, your body loses heat. Ice cleats that attach to shoes create a safer way to walk on slick surfaces. Most dogs can comfortably be walked out in the cold for short periods, but some canines need additional help staying warm. Most dogs benefit from a jacket, but it’s an especially important consideration for puppies, elderly dogs, smaller breeds and shorter-haired dogs, who may have a harder time staying warm. Choose a jacket or vest built for the cold and for repelling moisture. During and after walks, check clothing to ensure it remains dry. Wet clothing can make the walk miserable — much like cold, wet socks would for us. 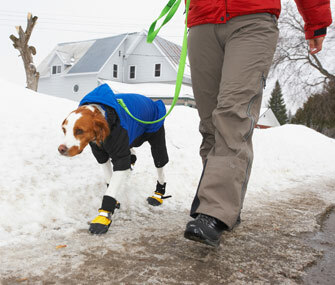 Protect paws with dog booties. Paws are at risk in the winter from de-icers used on the ground and from freezing temperatures that cause paws to dry and crack. Look for booties with secure traction on the bottom and Velcro straps to snugly hold them to the paws. Teach your pooch to tolerate booties by associating them with treats. Once your dog has his booties on, distract him by immediately heading out on a walk or moving his attention to an activity, like eating dinner. If your pet simply won’t tolerate booties, bare paws can be given additional protection by using pet-safe gels. Mushers Secret is a gel that can be placed on paw pads to protect your canine from wintertime harshness. Petroleum jelly can also be used. As soon as you return from your walk, wipe down your dog's paws with a pet safe wipe to remove the jelly and any de-icers. Don’t allow your dog to lick his paws and ingest the gel. Keep hair on paws trimmed short to help prevent snowball accumulation. Canines pulling on leash are difficult to walk, especially on slick winter ground. Thus, a front clip harness is ideal to minimize pulling while you train your dog. Use a solid leash, not a retractable, for better control. Another option is a jogger leash that goes around your waist and attaches to the dog’s collar. In the event that you trip and fall, this type of leash leaves your hands free and stays hooked, regardless of whether you keep a grip on it or not. Dogs with certain conditions, like arthritis, may have more difficulty walking outside in the cold, because it causes joints to stiffen. Talk to your veterinarian about ways to decrease discomfort and what type of exercise would best suit your pet. If your dog is shaking, picking up his or her feet, cowering or attempting to head back home, listen to what he is telling you and go back indoors. And if it's just too cold for you and your dog to get outside, look for ways to exercise your dog in the house.